Unfortunately, another boating accident occurred in Florida over the weekend. Coincidentally, it happened in Biscayne Bay, the same location of a fatal boating accident handled by our firm that resulted from the collision of two high speed boats. In the accident that occurred this weekend, a forty-foot outboard powered boat was being pushed off of a popular sandbar with the operator of the boat assisting by placing the boat in gear. Although the incident is still being investigated, it has been reported that one of the people helping to push the boat off the sandbar was struck by one of the boat’s propellers causing devastating wounds. Despite being rushed by helicopter to the nearest emergency room, the young man could not be saved. The sandbar at issue is a popular spot for boaters to congregate. At times, it can have a rowdy atmosphere with drinking. It is currently unknown whether the operator of the boat was under the influence of alcohol, or any drugs, at the time of the incident. Blood alcohol testing was not performed as the Florida Wildlife Commission did not observe physical signs of intoxication that would provide probable cause to perform such testing. As a result, even if the operator of the boat was under the influence, a criminal prosecution is extremely unlikely. This situation highlights one of the differences between civil claims for personal injury and criminal prosecution. Even if the state attorney does not charge the operator of the boat, a civil attorney will have the ability to gather evidence and bring a claim for wrongful death, including seeking punitive damages, against the operator of the boat if there are witnesses who observed the operator of the boat drinking alcohol prior to this incident. Even without intoxication, the operator of the vessel was probably negligent in running the engine while someone was near the area of the propellers. As such, the lack of a criminal prosecution does not stand in the way of civil justice. Every year, there are fatal boating accidents in Florida. In April of 2009, Jacksonville was the scene of the worst boating accidents in recent Florida history when five persons died and others were injured when a boat carrying fourteen persons crashed into a dock on the Intracoastal Waterway in St. Johns County, Florida. While the operator of the boat was not intoxicated she did have alcohol in her system. Other persons in the boat with more boating experience let her drive because they were intoxicated. Personal injury or wrong death claims resulting from boating accidents have a special set of laws that apply. These laws are referred to as “admiralty” or “maritime” claims and follow a separate set of rules, with a separate statute of limitations and potential limits of liability. As a result, any persons injured or seeking recovery for the wrongful death of a family member should hire an attorney experienced in maritime and admiralty claims. A recent boating accident on Black Creek north of Green Cove Springs left five people injured, reminding us all of the potential dangers of boating on North Florida’s crowded waterways this summer. The accident occurred on Black Creek July 2 when a 21-foot powerboat ended up on the shore after plowing through 25 to 30 feet of trees and shrubs. Investigators are not sure how the boat, carrying eight passengers, ended up on shore. According to the Florida Fish and Wildlife Commission, the boaters were on their way to Knight’s boat ramp near Highway 17 in Clay County when they hit the trees along the shoreline. Prior to the accident, the boaters stopped at a rope swing about two miles west of the Highway 17 bridge on Black Creek. After they left, a witness said he heard a loud noise when the propeller came out of the water. The witness reported seeing the boat’s canvas top among the trees and two children waving for help. When he got closer, he noticed the boat landed about 15 yards on land. Five of the eight people, including the boat’s driver, were injured and were taken to Shands Jacksonville Medical Center. The remaining three, all children, were not injured. Investigators are not sure how fast the boat was going. One factor that may have played a role in the Clay County boating accident is the fact that boats have no brakes. Once a boater realizes he or she is in danger, it is too late to prevent the boat from continuing forward. Putting the boat in reverse can help in these situations, but often this does not prevent boating accidents leading to personal injuries. motorboats, like the one in this accident, are involved in the majority of boating accidents due their low profile in the water along with their ability to travel at high speeds. Boating accidents like this are all too common in Jacksonville, especially during the summer months. In fact, with close to one million registered watercraft, Florida leads the nation in boating accidents and injuries. According to the Florida Fish and Wildlife Commission’s most recent report, Duval County ranks 13th among Florida’s 67 counties with 14 boating accidents in 2010. St. Johns County ranks worse, coming in twelfth with 15 boating accidents during the same time period. Overall in Florida, there is a sharp increase in boating accidents in May, June and July. The Florida Fish and Wildlife Commission stresses that safe boating is a choice. The Commission recently launched a public awareness campaign promoting boating accident prevention called “Wear It Florida,” which encourages the use of life jackets and increases awareness of inflatable life jackets, which are convenient and relatively easy to use. Please refer to our previous blog for more tips on preventing boating accidents along Jacksonville’s waterways. With easy access to a number of lakes, the St. Johns River, the intracoastal waterway and the ocean, summertime is perfect for boating in Jacksonville. Heading out on a boating adventure with the wind whipping through your hair seems like the perfect time let loose and be carefree. Unfortunately, this is how boating accidents often happen. Carelessness and inattention are the primary causes of boating accidents, according to The Florida Fish and Wildlife Commission. 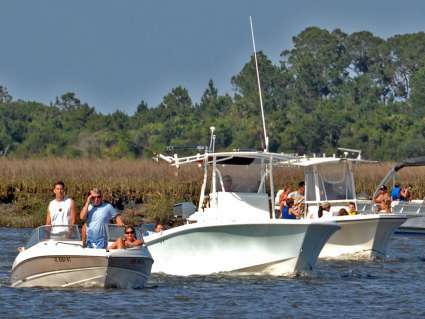 Here in Jacksonville, there were 19 boating accidents, four deaths and five injuries in 2011. In Florida, 67 people died as a result of boating accidents in 2011. Clearly, there are precautions boaters can take to reduce the number of boating accidents in Jacksonville. The most frequent types of boating accidents include colliding with another boat, flooding, or colliding into a fixed object like a dock. Last month in St. Augustine, two people died and one was injured after their boat crashed into a dock. Crowded waterways add to the likelihood of accidents. There are more than 29,000 personal watercraft registered just in Duval County alone. Numerous boats trying to get in and out of the water at popular boat ramps can lead to all kinds of issues. Long lines, frustration and fights among boaters, not to mention accidents while loading or unloading, have led to what many refer to as “ramp rage.” Courtesy and patience go a long way in these situations. Preparation and planning are an important part of boating safety. Last summer in Jacksonville, the Coast Guard rescued a boater who had no boating experience or proper supplies, not to mention the fact there was a storm on the horizon. Taking a safe boating course could make the difference between a nice day on the water or a tragic boating accident. There are a number of courses available covering all aspects of boating safety, from reading the weather correctly to basic navigation skills and making sure your boat is safe before you set sail. Many courses are available, some even online, through Boat U.S. Foundation or BoatEd, among many organizations. Even experienced boaters can encounter problems, such as motor failure or battery issues. The U.S. Coast Guard Auxiliary provides free Vessel Safety Checks that can be performed wherever your boat is located – in your driveway, at a marina or even in your driveway. The safety check takes just 30 to 45 minutes and boats passing the exam receive a decal alerting the authorities that your boat meets all Federal and State boating laws. Boats that do not pass are given a report explaining how to correct problems. Many fatalities occur when a passenger falls overboard without a life jacket. It is easy to dismiss life jackets, especially for good, strong swimmers, but everyone should wear one. The Florida Fish and Wildlife Commission reports that more than 67 percent of all boating accident deaths in 2012 may have been prevented if life jackets had been worn. Finally, safe boating means no alcohol. Florida laws are just as strict for boating under the influence as they are for driving while intoxicated. Designate a safe, experienced, sober driver while out on the water. All of these tips can lead to lots of safe boating fun this summer. Four boaters on Florida’s West coast are relieved to have avoided serious injuries after their 23-foot boat overturned. The boat flipped after striking a sandy beach jutting out into the Intracoastal Waterway. Firefighters arrived on the scene to find the boat about 20 feet up on the beach. The passengers dug themselves out from under the boat, and were able to free a child who was trapped underneath. The boy was taken to the hospital as a precaution, according to the Florida Fish and Wildlife Conservation Commission. A similar occurence happened just south of Jacksonville recently on Black Creek, when a man operating a small boat lost control and struck trees coming out from the bank. One person died in that accident. Boaters should be aware of the dangers of running aground, or striking objects, especially at night. Hitting a sandbar at even a slow speed can cause a serious boating accident, since boats have no seatbelts and passengers can easily be ejected. Jacksonville boaters should pay particular attention to the unpredictable terrain in the St. Johns River and the Intracoastal Waterway, where there are many sandbars and hidden shallow areas. Making sure your boat has working lights and slowing down in uncertain areas can help boaters avoid accidents. Taking a boating saftety course, like the one available through the Florida Fish and Wildlife Conservation Commission, is another way to avoid a mishap. With the warm weather, our local waterways have once again become crowded with boaters. Unfortunately, every spring and summer, we also see an increase in boating accidents. Sunday night a small motorboat crashed into the Cesery Boulevard Bridge in Jacksonville, totalling the boat. Surprisingly, no personal injuries were reported. Witnesses say the driver of the boat was pulled from the water by people in a nearby fishing boat. The driver was then taken to shore and left the area. The Florida Fish and Wildlife Conservation Commission is investigating. Given that the driver of the boat left the scene, it seems that alcohol may have played a factor in this boating accident. For some reason, some boaters think it is acceptable to operate a boat while intoxicated. The results of doing so can be tragic. Just last April, five people died in an accident in the Palm Valley area of Ponte Vedra. That accident involved an overloaded boat with numerous intoxicated passengers and an inexperienced driver operating the boat. A sailor from Kings Bay Naval Submarine Base died in a boating accident this weekend on the St. Marys River. The St. Mary’s River forms the border between Florida and Georgia just north of Jacksonville. The victim was with seven other people on a 20-foot recreational power boat when he fell off of the boat at about 4 p.m. He was at the front of the vessel, which apparently had been traveling about 15-20 mph when he fell into the river. Unfortunately, he was not wearing a life preserver. As Jacksonville boat accident lawyers, we see serious personal injury and wrongful death result far too often from boat accidents. Because it is easy to fall out of a boat or to be thrown from a boat if it strikes another object, it is imperative to wear a life preserver when boating. Even good swimmers should do so as a collision may render a person unable to swim either by injury or lack of consciousness. Here in the Jacksonville area and Southeast Georgia, we have a lot of beautiful waterways for boating. However, that beauty can be easily spoiled when a boating accident occurrs. Unfortunately, this weekend another such example took place. One person was killed and two others survived after a 23-foot boat rammed into the jetties at Jekyll Creek south of Brunswick Sunday. The cause of the accident is under investigation by the Georgia authorities. As injury attorneys in Jacksonville, we see numerous boating related personal injuries. Often such injuries result from the driver of the boat striking a dock, another boat, or an underwater structure such as a jetty or shoal. Drinking is commonly involved in boating accidents.